Michell Bearings designs and manufactures Lineshaft Bearings for both naval and commercial marine applications. We have three ranges of standard horizontal bearings for lineshaft applications. For naval applications the Naval Plummer Lineshaft (NPL) series covers shaft diameters from 250mm to 750mm and is specially designed to handle typical naval shock requirements. This range can be supplied as centre flange or pedestal mounted. For commercial applications the Marine Self Aligning Bearing (MSA) series is a modular range covering shaft diameters from 256mm to 579mm. 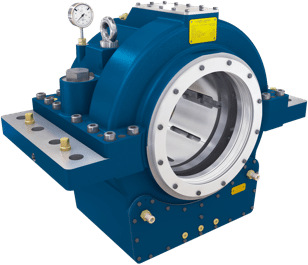 The Industrial Horizontal (IH) series has also been adapted for use in commercial and naval marine applications and covers shaft diameters from 280mm to 1000mm. We can also offer bespoke bearing solutions to suit individual project requirements, where required. Robust and reliable designs based on extensive experience. Radial loads can be supported on whitemetal lined journal bushes or whitemetal lined tilting journal pads. The use of tilting journal pads increases the dynamic shaft misalignment capacity of the bearing. High pressure oil injection can be incorporated in the radial bearing if required. 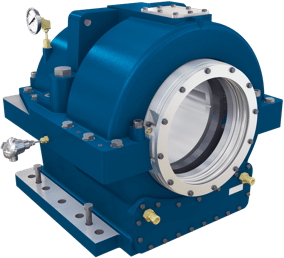 Fully self-contained, water-cooled designs are available with proven methods of transferring oil from the bearing sump to the working faces of the bearing at all duty conditions. Various cooler materials, typically cupro-nickel, stainless steel or titanium, are available to suit individual specification requirements. Forced oil lubricated or circulating oil cooled solutions are available if required together with the associated oil lubrication systems. Proven sealing solutions to withstand emergency flooded compartment requirements. 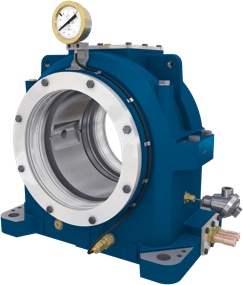 Robust naval bearing casing designs to withstand explosive shock forces.